When I was asked by a special friend of mine in a unique Nigerian Online hub of Future leaders (#Intrepid), to give my take on the rationale behind the silence of the International media (CNN, BBC, etc) that played a key role in ousting the President Goodluck Jonathan Administration earlier this year, I was reluctant because I felt Nigerians only enjoy sensation and abhor facts. I took the initiative to give them two hours from my tight schedules while preparing for a flight. That benefit of a doubt proved me very wrong about Nigerians. We love conspiracy theories! We love to know, even though we find it difficult to accept the outcome of the eventualities, should our bubbles be popped. I spent close to one year in Nigeria’s burgeoning online media space, (having focused majorly on technology, catering strictly to U.S. & European audiences) but getting to know people and what makes them tick. Those (Nigerian online social media self crowned overlords) who saw me as a threat blocked me at the instant of seeing a superior argument, which they can’t stomach on their TL. Just like our government, we like people who agree with us without asking questions. Thus the saying that the Government of any nation reflects the people. There’s been many questions, scary ones too. I won’t attempt to answer any of the above questions which may reflect bias or pontification but will open up resources, raise rhetorical questions and analysis that will help you draw your own conclusions. The same question need be asked how Boko Haram, (a virulently anti-Western Islamist movement. Its name, roughly translated, means “fake education is forbidden,” but in practice the term “fake” refers to Western education. It was founded in 2002 by Mohammed Yusuf, a Salafist preacher who created a school to provide an Islamic alternative to Westernized schools. 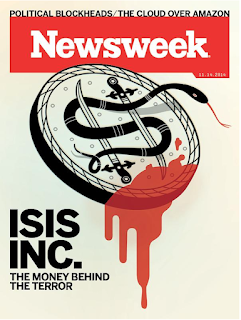 Over time it became a recruiting tool for Boko Haram fighters. The group envisions creating an Islamic caliphate throughout Africa. Yusuf was killed by police in a 2009 uprising, and was replaced by Abubakar Shekau, who recently pledged the group’s alliance with ISIS.) can maintain its strength (supplies and strikes) and steady recruitment after a major decimation by the administration of President Goodluck Jonathan? 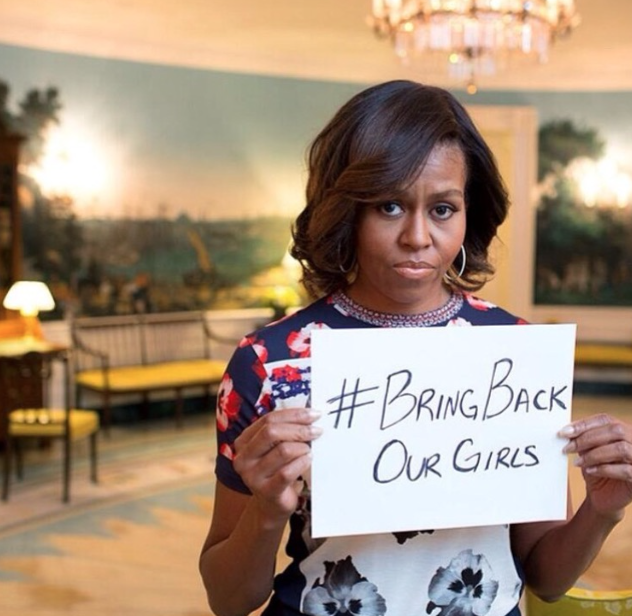 Then the notorious Islamic terrorist group, Boko Haram, kidnapped 278 school girls from the town of Chibok in northeastern Nigeria last year, Michelle Obama began a Twitter hashtag campaign, #BringBackOurGirls. But behind the scenes, the Obama administration was undermining Nigeria’s efforts to take the battle to the terrorists. Obama refused to sell Nigeria arms and supplies critical to the fight, and stepped in to block other Western allies from doing so. The administration also denied Nigeria intelligence on Boko Haram from drones operating in the area. While Boko Haram was kidnapping school girls, the U.S. cut petroleum purchases from Nigeria to zero, plunging the nation’s economy into turmoil and raising concerns about its ability to fund its battle against the terrorists. Nigeria responded by cancelling a military training agreement between the two countries. David Axelrod is credited as the force behind President Obama’s election victories in 2008 and 2012. He served as Obama’s Senior Advisor until 2011. A well-placed Nigerian interviewed for this report who asked to remain unidentified says that influential Nigerians within and outside the government believe Obama deliberately undermined the war effort and sabotaged the Nigerian economy to make President Goodluck Jonathan appear weak and ineffectual, and thus bolster the electoral prospects for AKPD’s client, General mohammadu Buhari. "In the last year, Nigeria sought aid from the White House for many initiatives, including the fight against Boko Haram. In turn, the Buhari-led Nigerian opposition used the U.S. government’s position as validation for their claim that the Nigerian government was a failure". "The U.S. government has up till today refused to grant Nigeria’s request to purchase lethal equipment that would have brought down the terrorists within a short time on the basis of the allegations that Nigeria’s defence forces have been violating human rights of Boko Haram suspects when captured or arrested. We find it difficult to understand how and why, in spite of the U.S. presence in Nigeria, with their sophisticated military technology, Boko Haram should be expanding and becoming more deadly". "The U.S. government has frustrated Nigeria all the way in our war against terrorism despite its public statements in support of Nigeria, as it fights the Boko Haram insurgents in the North-east… They want us to fight Boko Haram with our arms tied to our backs. Former Head-of-State, Retired Gen. Yakubu Gowon publicly stated last November that America is no friend of Nigeria. After exhausting all avenues, the Nigerian government finally turned to Russia, China and the black market to obtain needed arms, and as a result has gone aggressively on the offensive against Boko Haram, retaking some 40 townsoccupied by the group and killing at least 500 terrorists. According to recent accounts, Boko Haram has gone to ground in the northeastern border regions. But whereas the border states of Niger, Chad, Benin and Cameroon formerly took a hands-off approach, they have now joined in the effort to destroy the group, pledging a total of 8,700 troops. Most recently, Boko Haram has been cleared of its northeastern strongholds in Borno, Yobe and Adamawa. The Obama administration has said it is barred from supplying weapons by the so-called Leahy Amendment which forbids foreign states that have committed “gross human rights violations” from receiving military aid. However this did not stop the U.S. from sending Special Forces to Uganda—another country accused of such violations—to assist in capturing Lord Resistance Army leader Joseph Kony. Nor did it prevent Obama from supporting al Qaeda-linked rebel groups in Libya, who later went on to attack the Benghazi mission, and have now joined ISIS. 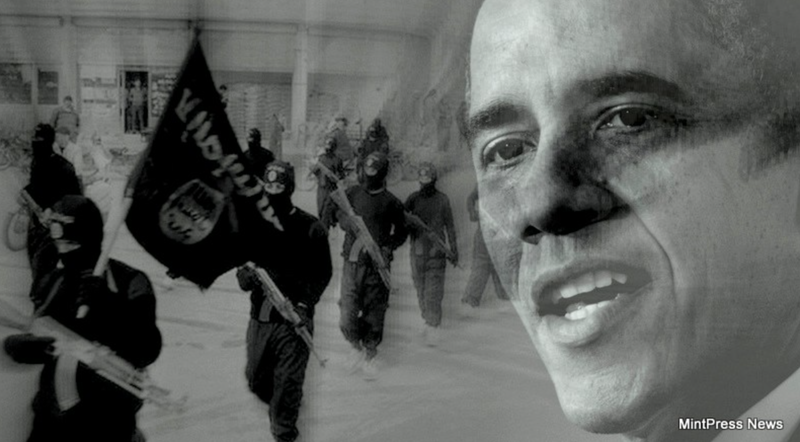 The Syrian “moderates” the administration claimed to back are also allegedly joining with ISIS. In fact, Obama supported the Islamic radicals who destabilized states throughout the Middle East, including Tunisia, Libya and Egypt, and did little to prevent Iranian-backed Shiites from overthrowing Yemen—a key ally in the War on Terror. And despite claims that the U.S. “does not negotiate with terrorists,” the administration did so in secret with the Taliban for years, most notoriously over the release of Bowe Bergdahl. The U.S. State Department is currently negotiating a deal that will enable Iran to obtain the bomb, and it just declared that Iran and its Lebanese proxy, Hezbollah, are not terrorists. The administration even claims Iran has been an ally in the War on Terror! Finally, Axelrod’s client, Gen. M. Buhari, has been accused of human rights abuses during his time as chief-of-state. To top it off, Secretary of State John Kerry made a mockery of the administration’s pretext by hinting in January meetings with both President Goodluck Jonathan and APC Presidential Candidate as at then General Muhammadu Buhari that the Obama administration might allow weapon sales after the election. If the U.S. was so concerned about human rights violations, how could a mere election change that? Given the perception that Buhari has Obama’s implicit support, this sends an unmistakable message. The administration also rationalized its decision to cut purchases of Nigerian oil by claiming that output from domestic oil fracking has reduced America’s dependence on foreign oil. But that begs the question: why have U.S. oil imports from other nations increased at the same time? Nigeria was formerly among America’s top five oil supplying countries, and America its largest customer. Nigeria relies on oil revenues for 70 percent of its budget. America’s decision to look elsewhere has been catastrophic for Nigeria’s economy. A Deutsche Bank analyst noted that the decline in Nigeria’s oil sales to America “proceeded much faster than for the U.S.’ other major suppliers,” and concluded that singling Nigeria out this way had to be driven by politics. 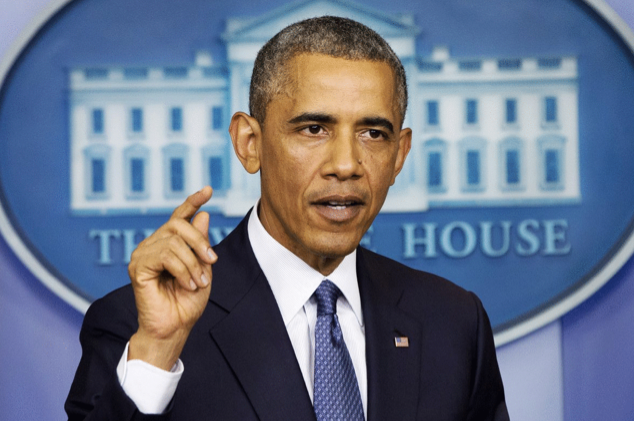 Nigeria is not the only country where Obama is using oil as a foreign policy weapon. The U.S. has not renewed its 35-year-old agreement with Israel to provide emergency supplies of oil, despite booming U.S. oil production. The agreement expired in November 2014. At the time, the State Department claimed to be working on renewing the agreement, but has yet to do so. There are however, many flattering articles about Axelrod, like the Times reviewof his book, Believer. NBC also noted Nigerian ambassador Adefuye’s complaint about U.S. refusal to provide weapons to Nigeria, and how both issues impacted Nigeria’s ability to fight Boko Haram—but there was no mention of Axelrod’s assistance to General M. Buhari. "I will continue to show openly and inside me the total commitment to the Sharia movement that is sweeping all over Nigeria… God willing, we will not stop the agitation for the total implementation of the Sharia in the country"
Embarrassed by the kidnapping and the perceived association between Buhari’s supporters and Boko Haram, AKPD claimed that they discontinued work for Buhari in early 2014. However, The Washington Free Beacon has unearthed emails showing that they continued to quietly aid APC into at least January of this year. Their campaign was successful and they (Obama's AKPD & GMB) recorded a victory by a margin as projected by opinion polls not surprisingly, the reasons cited for President Goodluck Jonathan’s unpopularity include the perception that he is weak and ineffectual against Boko Haram, and that the economy is in a sorry state. Most Americans are unaware of the critical role Nigeria plays in African politics. In addition to being Africa’s largest oil producer, Nigeria is also the continent’s most populous nation, with an estimated 162 million people, and is home to approximately 12.5 percent of the world’s total black population. Additionally, Nigerian Americans are very productive and well represented in the fields of medicine, sports, engineering, and academics. Annual remittances are $21 billion, with America providing the largest proportion. It is ironic at best that America’s so-called “first black president” is alienating such a nation, especially given its powerful influence throughout Africa. Because of Obama, America is losing allies the world over. Despite his so-called outreach to “the Muslim world,” the few Muslim allies America has are calling him out. For example, observe the unprecedented spectacle of Arabs cheering Israeli Prime Minister Benjamin Netanyahu’s speech before the U.S. Congress. Columnist Dr. Ahmad Al-Faraj of the Saudi daily newspaper Al-Jazirah, called Obama “the worst president in American history.” The only Muslims Obama seems to like are those who hate America, and he is going out of his way to court them, come what may. "Its been obvious since Obama was elected that he was a closet Muslim. Now, he doesn't care who knows it. He has obtained the tacit understanding of media outlets and his own party that NOBODY calls him out on it. He's a traitor to the United States and out middle eastern allies"- Mark Schll. MintPress News report in January this year, also published online the story on an alleged ISIS member who is thought to be a Pakistani commander named Yousaf al-Salafi, has said that the terror group receives regular funding from the United States. Al-Salafi has confessed to the Pakistani ISI intelligence agency, that he has received funds for the terror group via U.S. funders. Al-Salafi was arrested in Lahore, along with two companions, on January 22, according to the news agency, the AFP. “During investigations, Yousaf al Salafi revealed that he was getting funding – routed through America – to run the organization in Pakistan and recruit young people to fight in Syria,” the Urdu-language Daily Express reported from a source in the ISI, speaking on the condition of anonymity. The news agency’s sister newspaper The Express Tribune said that he has been receiving around $600 per person he sends to Syria for training. “The US has been condemning the IS activities but unfortunately has not been able to stop funding of these organizations, which is being routed through the US. The US had to dispel the impression that it is financing the group for its own interests and that is why it launched offensive against the organization in Iraq but not in Syria,” the source reported. Still, Al-Salafi did not specify who he has been receiving funds from in the U.S., though the implications were that it was funding given via government sources. “Yes that is true as this issue was raised several times in the local media and even in the diplomatic corridors between US and Pakistan and there was media reporters here suggesting that hundreds of recruits have been exported to train from Pakistan,” the anonymous Pakistani intel source told the Sputnik news agency". Reuters reported also in January a week before the above account that Al-Salafi’s identity is a terror leader who comes from a Pakistani-Syrian background. He came to Pakistan via Turkey only five months ago, and quickly established an ISIS cell there which has flourished and carried out attacks against Shiah Muslims. "Boko Haram militants have taken over the highway linking Maiduguri and Damaturu, capitals of Borno and Yobe states respectively. A police officer stationed in one of the villages along the highway, told PREMIUM TIMES that travellers are being asked to return as the terrorists have taken over the road between Benisheik (a town 85km away from Maiduguri) and Ngamdu (35km away from Damaturu). The officer, who asked that his identity be protected for security reasons, said the terrorists had attacked Ngamdu village and killed 10 persons there. “As I am talking to you now, soldiers are moving towards Benisheik, while we are here asking motorists to return to Maiduguri until the road is cleared,” he said. There is no security checkpoint between Benisheik and Ngamdu, which is about 25km stretch of road". This is coming against the backdrop of repeated promises of crushing the notorious sect within two months after being elected President. 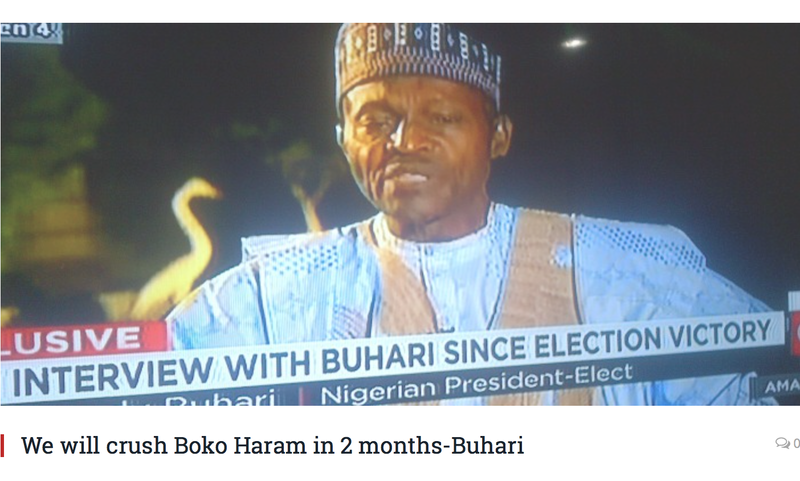 We are days to the completion of the time frame and Boko Haram seemed to be getting more invincible. There's yet to be a single counter attack recorded by the General M. Buhari's current sole Administration against the terrorist but for the announcement of a probable negotiation with the Boko Haram Sect. Kareem Haruna, reporting from Maiduguri stated in a contribution to voice of America that Nigerian authorities have released 180 people who were arrested for alleged links to Islamist extremist group Boko Haram. The release of the captives comes a month after a report by Amnesty International alleging severe detainee abuse by the Nigerian military. Some of the 180 men, women and children who were released Monday by the military in the Borno State capital of Maiduguri told VOA they suffered no ill treatment during their detention. Usman Lawan, a farmer from the town of Konduga, said he was arrested on suspicion of belonging to the sect and held for two months. He said he wants to go home. “If there is way, I will go back there again. If there is no way, I will seek for government provide care again,” he said. The move was welcomed by Amnesty International, whose report documented torture and extrajudicial murders by the military at detention centers in the northeast. The military called the report blackmail, but Nigerian President Muhammadu Buhari promised to investigate its claims. Amnesty Africa director for research and advocacy, Netsanet Belay, said those released need to be properly compensated. “Our research suggests that there were deplorable detention conditions and these have been victims of that detention. And so there is a critical need for the government to ensure that there is adequate compensation and reparations program initiated with immediate effect to support these victims,” stated Belay. Borno State governor Kashim Shettima said the state would allow the former detainees to go back to school and give them training so they can find work. In all this all I want to ask the audience is on who's side is Obama led U.S. on? What has really changed? Where do we go from here? "In a time of drastic Change it is the learners who inherit the future. The learned usually find themselves equipped to live in a world that no longer exists". As regards the President's (GMB) dilemma however, with the various obligations owed to the Obama led U.S. administration (their expectation of his compliance and cooperation as it fulfills their foreign policy), his responsibility and loyalty to his political party (APC), which is currently in deep crisis, his obligation to the Northern leaders and finally his commitment to the various (81) campaign promises (miracles) to the masses who believed in the Change he brings as a Messiah. The information above were mostly the investigative journalism account of James Simpson, an economist, businessman and investigative journalist. His articles have been published at American Thinker, Accuracy in Media, Breitbart, PJ Media, Washington Times, WorldNetDaily and others. His regular column is DC Independent Examiner. Follow Jim on Twitter & Facebook Other references were from Newsweek Report of November 14th 2014 , The SunNewPaper, PunchOnline, Premium Times and MintPressNews.